For a video tutorial on how to turn your loved ones’ ugly t-shirts into yarn, click here. After starting and ripping out this rug several times, I settled on a striped rectangle that radiates out from the center cast on. The size of the rug you can make is only limited by the length of your circular needles (and the amount of yarn you have). It is worked over 2 circular needles. 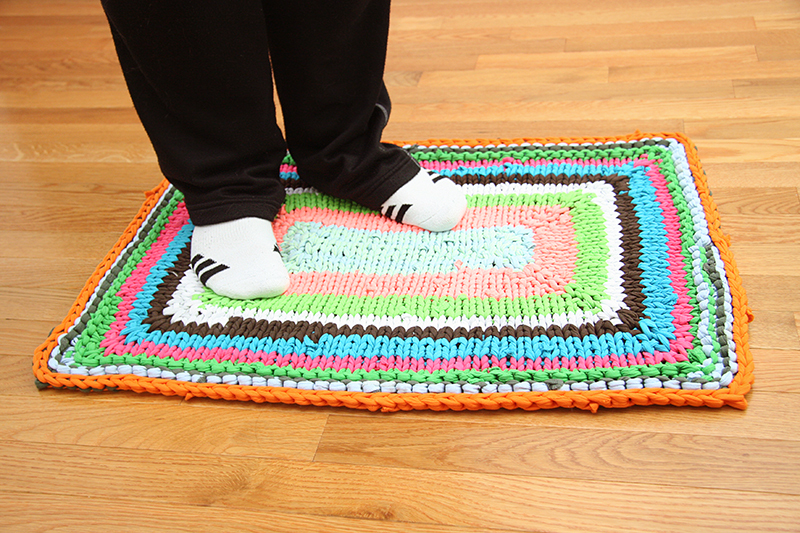 The rug pictured here used 2 48-inch cables with size 15 needles. Judy’s Magic Cast On is used in order to have live stitches going in opposite directions. Knitting around from needle to needle while increasing at each corner creates the flat rectangle that emanates from the center. When you reach the end of a ball of yarn you can use this join technique to join the next ball of yarn. 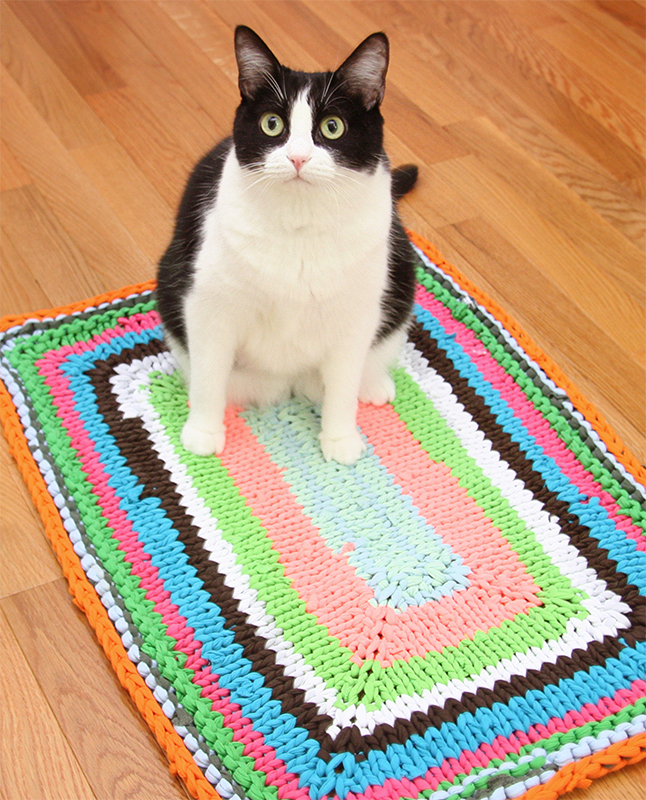 Or, you can simply drop the yarn and start knitting with the next and weave in the ends when your rug is completed. Gauge- 1.5 stitches per inch in stockinette on 2 size-15 or larger circular needles. Although, gauge isn’t critically important. Needles- 2 long circular size-15 or larger needles. 48-inch cable is recommended. Using Judy’s Magic Cast On, cast on 34 stitches (17 per needle). Even Round: On first needle, knit all stitches. On second needle, the cast-on loops are twisted so knit all stitches through the back loops to untwist them. After this round the stitches are worked normally. Set Up Round: On first needle, kf&b, pm, kf&b, knit until 2 stitches remain on needle, kf&b, pm, kf&b. On second needle, kf&b, pm, kf&b, knit until 2 stitches remain on needle, kf&b, pm, kf&b. Increase Round: On first needle, knit until 1 stitch before marker, kf&b, sm, kf&b, knit until 1 stitch before marker, kf&b, sm, kf&b, knit to end of needle. On second needle, knit until 1 stitch before marker, kf&b, sm, kf&b, knit until 1 stitch before marker, kf&b, sm, kf&b, knit to end of needle. Repeat these 2 rounds 11 times. Repeat these 2 rounds 1 more time. Bind off loosely, weave in ends, and block. 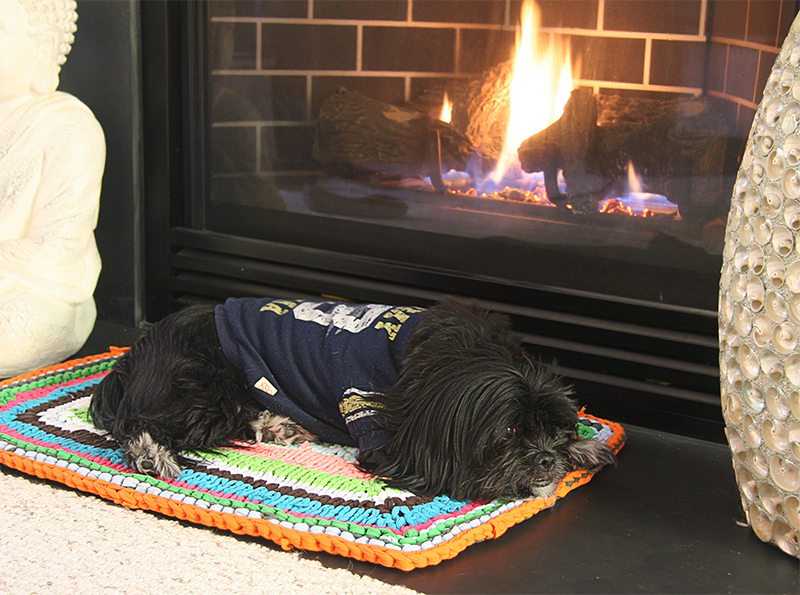 This rug really benefits from a good wet blocking. The t-shirt yarn is really stretchy and the rug comes off the needles a bit wavy and curly. Kf&b – an increase where you knit into the front and back of the stitch. Previous postNext on the Needles- T-shirt Yarn! I can’t wait to try this, but I still have to wrap my head around it lol. Lol!!! I love the title. This is so adorable. I love the colors you chose as well. What a fantastic use of old t-shirts. Your instructions are excellent. I definitely need to add this to my (very long) list of knitting projects ;-). wow, this looks like a lot of fun! And I just happen to have several t-shirts I was going to get rid of…this is a much better idea!! video isnt working on how to turn tshirts into yarn.